On a recent August afternoon, the Zuckerman Board Room at Eisenberg Village (EV) was bustling with busy hands and happy hearts. About thirty-five EV residents volunteered their time to be part of an international mitzvah to benefit poor Ethiopian Jewish school children in Haifa, Israel. An initiative of the Association of Jewish Aging Services (AJAS), Project Avodah, or serving God, is a global effort, partnering AJAS member communities, such as the Los Angeles Jewish Home, with an organization in Haifa. AJAS secured funding to purchase 360 backpacks for the children. 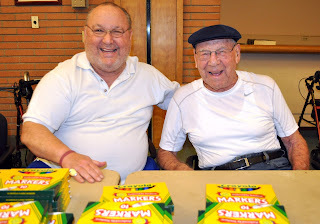 The Home stepped up to guarantee 100 of the backpacks would be filled with everything needed to start the school year, including a Jewish calendar, notebook dividers, glue, erasers, scissors, markers, crayons, pencils and pens, zippered pencil cases, pencil sharpeners, small calculators, book covers and name tags. And the residents? They rolled up their sleeves and got to work. “We have a mitzvah assembly line going,” exclaimed Rabbi Karen Bender, the Home’s director of spiritual life. And so it was, with each person adding their particular item, such a box of colorful markers, to the backpack and passing it on to the next person to add their item. At the end of the line, each backpack was filled with school supplies… and lots of love. Thank you to the residents of the Jewish Home for reaching out to the children of Israel with love and compassion.